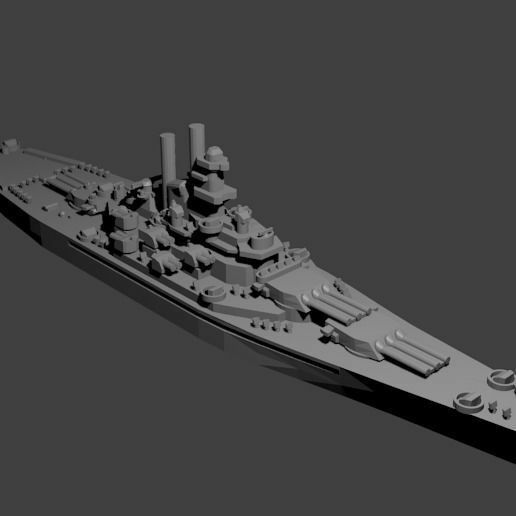 1/1800th scale Pennsylvania class battleship model. Certain elements not to scale. The Pennsylvania class was a pair of battleships built for the US Navy shortly before WWI. They were refit between the wars, however one of them, the USS Arizona, was lost in the attack on Pearl Harbor. The USS Pennsylvania saw service throughout the war and was retired shortly thereafter. They carried twelve fourteen-inch guns and up to twenty-two five-inch guns along with some lighter armament.